Even so, he was unable to contain his composure in the face of the combined forces of police and social services. His last few weeks, he said before heading to Switzerland, had been blighted by visits from officers and social workers who threatened Ann with 14 years in jail if she dared so much as to book him an aeroplane ticket. I can quite understand why police and social services felt the need to make their first visit to the couple's Buckinghamshire home. Social services, according to Ann, had received a tip-off. Given that assisted suicide is not legal in Britain, of course they had to investigate. Yet surely, a five-minute conversation with Geoff is all they would have needed to establish that it was his decision, and his alone, to end his life at Dignitas. That much is clear from the open letter that he penned to MPs shortly before his death, explaining his decision and imploring them to change the law on assisted suicide. 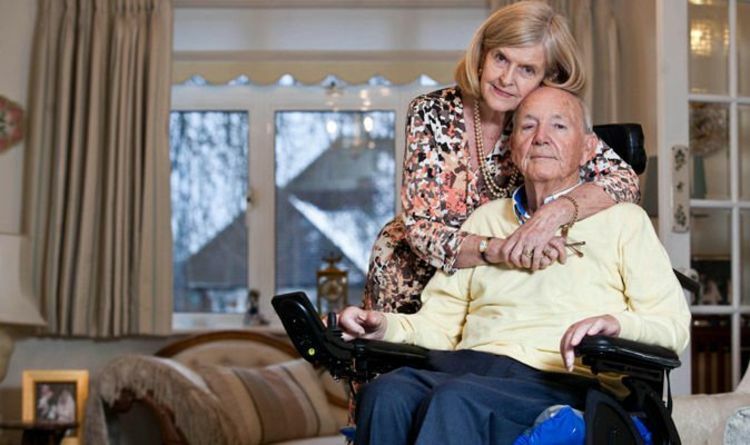 They could have seen clearly, too, that his motor neurone disease prevented him from using the online booking system that is now almost universal among airlines. If his wife was helping to carry out his instructions, it was only because of his physical disability. Having been satisfied that he was acting of his own free will, why couldn't police and social services have left the couple alone to spend their last few weeks together? To summon Ann to a police station to be interviewed under caution and threatened with a long jail sentence purely on the basis that she was helping her husband to make his travel arrangements constitutes a ridiculously pedantic interpretation of their duties. Surely, in the midst of an epidemic of knife crime, with the country awash with illegal drugs and fraudsters gleefully stealing pensioners' life savings there are higher priorities for law enforcement. Should Britain follow Switzerland and allow assisted suicide, or go further still, like Belgium and Holland, and allow patients to choose euthanasia? It is a hugely difficult area. On the one hand, you don't want to deny those who are going through intolerable suffering a chance of a dignified and painless departure from life. Yet on the other hand the problems of an assisted suicide law are obvious. There is a very grave risk of relatives, or others, putting pressure on people to end their lives. In the case of euthanasia, where a doctor is allowed to deliver a fatal dose of drugs, according to instructions from the patient, there is also a danger of people opting to end their lives but then changing their minds before the time comes. It is horrible to contemplate someone being euthanised on the basis of a living will they had made before they fell ill – when, had they been asked at the crucial moment, they would have opted to live. With the Swiss law on assisted suicide there is less risk – as the patients themselves have to deliver the fatal dose of drugs. It would be a big step, however, for Britain to change the law in this direction. There would inevitably arise the question: were terminally-ill people feeling under pressure to make the decision prematurely to end their lives because they felt it was expected of them? You don't have to approve of euthanasia and assisted suicide, however, to see that what happened to Geoff and Ann Whaley was wrong. This was hardly a case of someone mixing up a fatal concoction of drugs, handing it to a sick and confused relative and saying: "Come on, drink it up, dear." Nor was it a case of a callous bystander shouting: "Go on, jump!" at someone teetering on a ledge on a high building. Those would be genuine cases of assisted suicide which would deserve to be met by the full weight of the law.